From Come Dine With Me to Countdown, Gogglebox to Father Ted, publicly owned Channel 4 has kept us entertained and informed since 1982. Documentaries, like Educating Essex, have shown us new perspectives, while comedies like Peep Show have kept us laughing and given new talents their big break. This success is linked to Channel 4’s public service broadcasting remit – producing innovative and quality content. Many people do not realise that Channel 4 is publicly owned. It is commercially run which means it funds itself through advertising and doesn’t cost us a penny. In fact, Channel 4 makes up to £2 billion for the economy each year. Profitable and high quality – what’s not to like? Privatisation of Channel 4 was proposed in 2015 but now this is off the agenda - hurray! The government has even described Channel 4 as a “precious public asset” that will continue to be “owned by the country”. What's different about Channel 4? While there is nothing wrong with commercial channels like Channel 5, Channel 4 offers something unique. 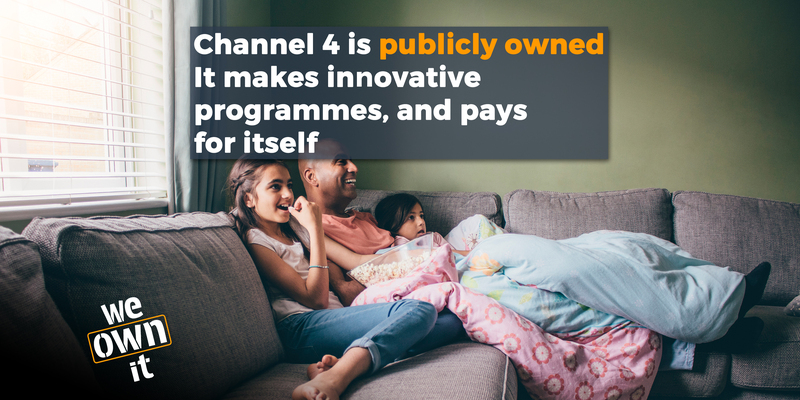 Channel 4’s public service mandate means it must be innovative, stimulate public debate, reflect the UK’s cultural diversity, nurture new talent, and champion alternative points of view. This is a big responsibility and has been really successful, making Channel 4 extremely popular with young people and minority audiences. The likes of Channel 5, on the other hand, don’t have to worry about all this, which can be seen in the graph below. Podcast: how might privatisation affect Channel 4? House of Lords - Report of Session 2016–17 - A Privatised future for Channel 4?